If I'm completely honest I had a major case of bloggers block this week and was so stuck on what to do for this weeks post. However my sister had the brilliant idea of doing a post based on my go to hair looks. Luckily for me my sister is also a bit of a wiz when it comes to all things hair, so this post is basically all thanks to her. 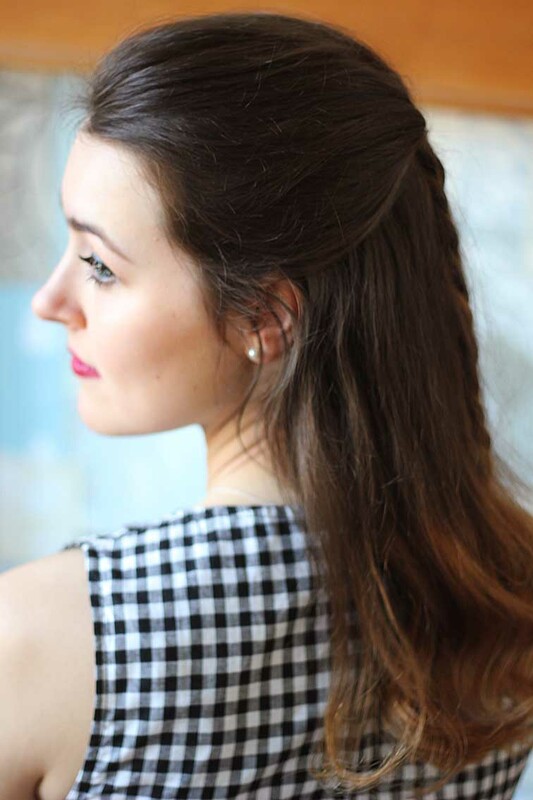 I'm going to be writing about the 'princess' style plait (see below) as I feel the other two hair looks (above) are pretty self explanatory. 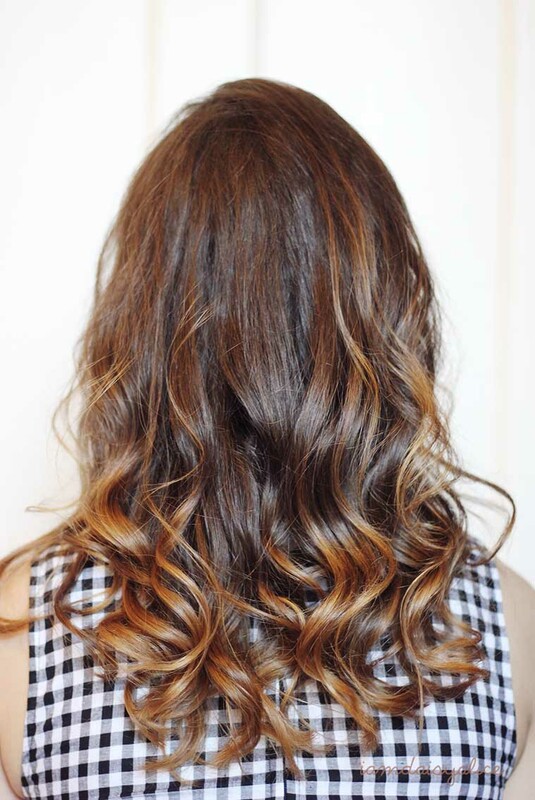 To create this look you will need to start off by loosely curling your hair, this step isn't essential but it creates a much more textured final look. 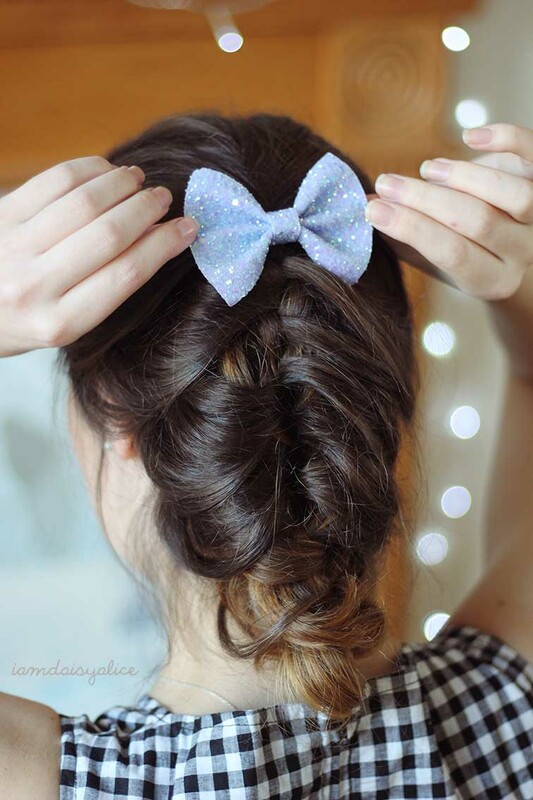 You will then need to make a small three strand plait from the hair in your crown and tie with an elastic, just as I've done in the photo above. However, I think I made my plait a little bit too tight it's important to have it a bit looser as this will be where you make the bigger plait from. The next step is to take a section of hair from the right side of your head and pull it through the gap in the small plait you just created. Repeat the same step on the left and continue to do so for the rest of the plait. As it reaches your neck it will be become easier for you to do as you will be able to bring it round to the front, which means you will be able to see what you're doing in a mirror. 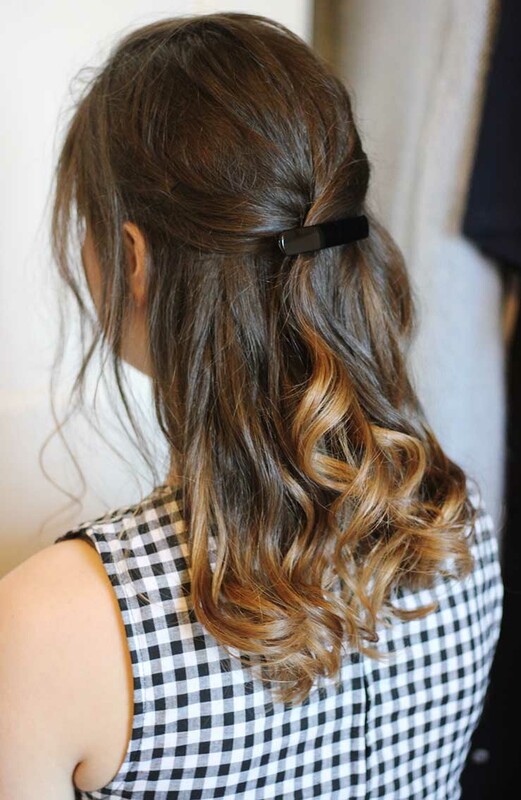 Once you have finished, you can loosen the plait to make the style as neat or messy as you like. 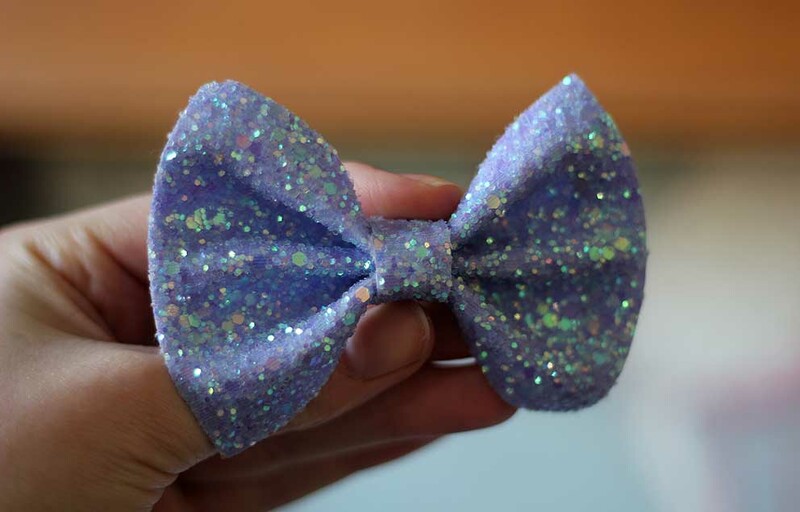 I finished off the hairstyle with one of the gorgeous glitter bows from Crown and Glory, I think they're perfect to pop at the top of a bun or ponytail. 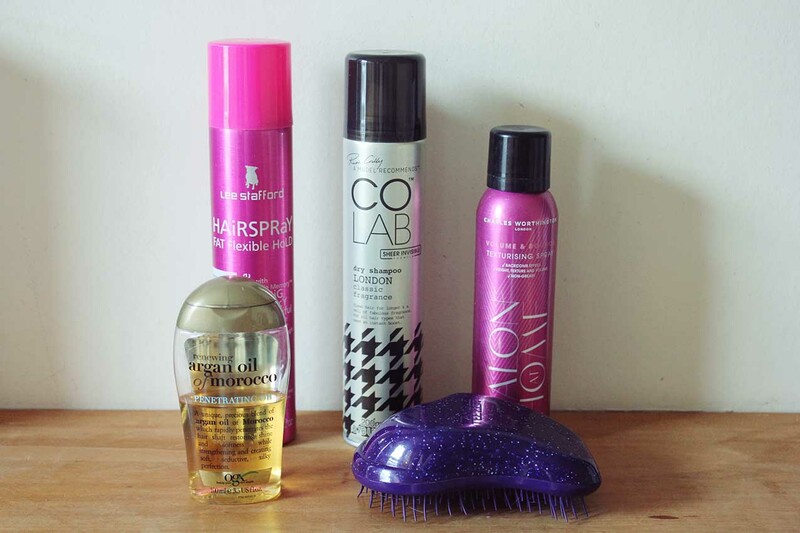 I thought I'd also include some of my favourite hair products some of which I've also used to create this look. My go to product when doing my hair for a night out is the Charles Worthington texturising spray. This spray truely is amazing, it recreates the feel and look of back combing without all of the hassle. I first heard out about this product via Fleur/Amelia's video when they were talking about dupes. They suggested that this was a great copy of the Oribe dry texturising spray and I popped straight to Boots and have never looked back, and what's even better it's a fraction of the price! I used this spray to create a bit more texture and volume in my hair so it didn't look quite so polished when I had finished the plait. Another amazing product is the Colab dry shampoo (in the fragrance London), this is the hair line brought out by fashion model, YouTuber and blogger Ruth Crilly. At first I was apprehensive to how this dry shampoo was going to be any different from the others, but it is! For me the best part of the product is the smell! I absolutely hate the smell of coconut and I find so many dry shampoo's have this scent, but the London dry shampoo smells exactly how you would want your hair to smell. The product scent is described as, 'a classic yet contemporary fragrance of bergamot, musk & magnolia' - all of which are my favourite notes in perfume. I'm yet to try the others but I've heard great things about the New York and Paris versions. I would love to know what you think of this post and if you try out the hairstyle yourself! You can pick them up in Boots or just click in the widget above to buy from Feel Unique! Aw its gorgeous, love it! I'm so glad you liked the post!